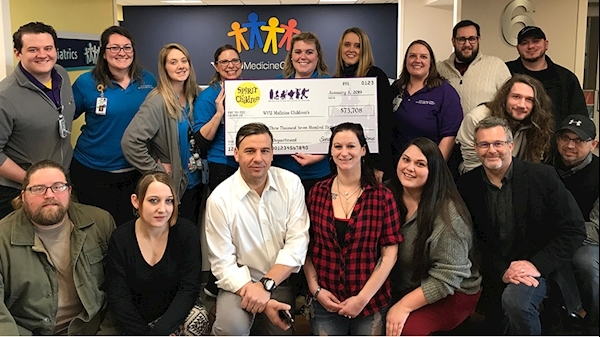 MORGANTOWN, W.Va. – Representatives from Spirit Halloween costume retail stores across West Virginia recently presented the Child Life Program at WVU Medicine Children’s with a check for $73,708, which was donated by store customers last fall. The WVU Medicine Children’s Child Life Team, including (standing, left to right) Stephen Surgener, Lauren Musinski, Kaitlin Travinski, Evy Wright, Jill Noha, Christine Haufe, and Bridget Ullery, accepts a $73,708 donation from area representatives of the Spirit Halloween Spirit of Children program. Funds raised help provide non-medical treatment and healing play. The most recent donation will be used to offset Child Life program salaries and to purchase a KittenScanner for the WVU Medicine Children’s tower, which will be completed in 2020. The KittenScanner is a miniature play-version of a computer-aided tomography (CAT) scanner that scans a toy and shows patients how the scanner works and why the exam is needed. Spirit Halloween collected proceeds for WVU Medicine Children’s at stores throughout West Virginia and Uniontown, Pa., online at SpiritHalloween.com, and from business partners. To-date, the Spirit of Children program, which focuses on making hospitals less scary for kids and their families, has raised $394,962 for WVU Medicine Children’s. Nationwide, Spirit Halloween team members supplied more than 80,000 costumes, accessories, activities, and décor items needed to host celebrations at 92 hospitals. Since its inception in 2007, Spirit of Children has brought smiles, laughter, and a much-needed escape to thousands of pediatric patients in 141 hospitals across the United States and Canada. One hundred percent of the money collected each year is given directly to the local Child Life Departments at partner hospitals. Spirit of Children raised more than $9 million in 2018, bringing its total contribution total to more than $54 million since the program’s inception. Spirit encourages customers to help make a difference in a child’s life this Halloween season by donating at their local Spirit Halloween or spreading awareness via Facebook and Instagram by using #SpiritofChildren and #MoreCowbell in their photos. For more information, please visit SpiritOfChildren.com.